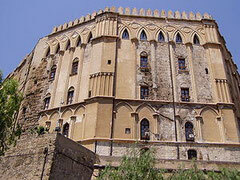 The Palazzo dei Normanni is a palace in Palermo, Italy. It was the seat of the Kings of Sicily. It was started in the 9th century by the Emir of Palermo and extended in the 12th century by Roger II and other Norman kings. The palace contains the Cappella Palatina, by far the best example of the so-called Arab-Norman-Byzantine style that prevailed in the 12th-century Sicily. The wonderful mosaics, the wooden roof, elaborately fretted and painted, and the marble incrustation of the lower part of the walls and the floor are very fine. Of the palace itself the greater part was rebuilt and added in Spanish times, but there are some other parts of Roger's work left, specially the hall called Sala Normanna. Since 1946 the palace has housed the Sicilian Regional Assembly.